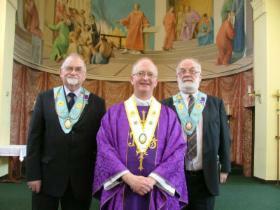 News - Welcome to St Lawrences Church in Feltham, Middlesex. The celebration continued in the School with the feeding of the 5,000, speeches – and the cutting of no less than four cakes! On Sunday 27th March we held a special Service of Induction for the parishioners who had joined the Knights of St Columba following their recruitment drive in February and Fr Chris was made an honorary Knight! 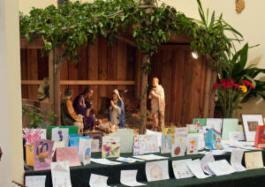 On Sunday 20th February we celebrated Education Sunday and the great mission of Catholic Education. 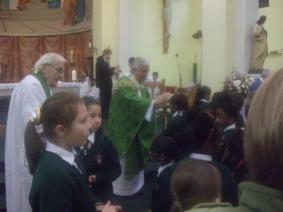 We were honoured that Archbishop Vincent Nichols chose to spend this day at St Lawrence's and celebrate the 11 am Mass. Around 700 parishioners turned up to welcome the Archbishop. Primary and secondary school children wore their school uniforms and they all sat on the floor at the front of the Church. Although emphasis is given to education in schools, Archbishop Nichols stressed in the homily that Education Sunday is not only a day to celebrate the work of schools, but the Christian formation of children that comes from all aspects of their life and their environment, the home, the community, the parish, where every word and action inspires them to draw out the talents that God has hidden inside them. Archbishop Nichols also mentioned something that Pope Benedict said during his visit to Britain in September 2010: "The road to happiness is the road that takes us close to God", concluding that if we are touching the heart of God, we are touching the heart of education. 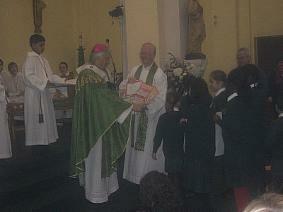 During the offertory, children attending St Lawrence’s school brought up drawings, pictures and cards which the Archbishop admired. Then, he blessed all the children in their uniform at the front of the Church. After Mass, parishioners had the opportunity to meet the Archbishop in the school hall, to take some pictures and share a few words over tea and cakes. Dozens of couples from St Lawrence's - some married for just a few months and other married for many decades - celebrated the love they share by taking part in a special Mass of Thanksgiving for the Sacrament of Matrimony on Saturday 12th February. During the Mass the couples renewed their Marriage Vows using the rite used for the blessing of marriages at Cana. Fr Chris then re-blessed their wedding rings. "It was truly LOVEly," said one couple, "We were both really moved ," added another. To celebrate the Feast of the Baptism of the Lord, we invited all the families whose babies have been baptised at St Lawrence's over the past year to a special Baptismal celebration around our Christmas crib. A somewhat noisy but very joyful event included the renewal of Baptismal promises and a relighting of the babies' Baptismal candles.